HIROSHI YUASA was born in Hyogo Province of Japan in 1933. He was a student of Hiratsuka Un’ichi and created his reputation through regular exhibits at The Annual To-no-Kai Print Shows held in the Osaka Contemporary Arts Centre in Spring and Gallery Masagu in Autumn where he has achieved recognition for his skill in creating an amazing atmosphere in a scene while only using traditional, Japanese Black Sumi Ink. It should be noted that Sumi can only be used on wet washi so many of his woodblocks will show faint wrinkles in washi due to using these age old printing techniques. 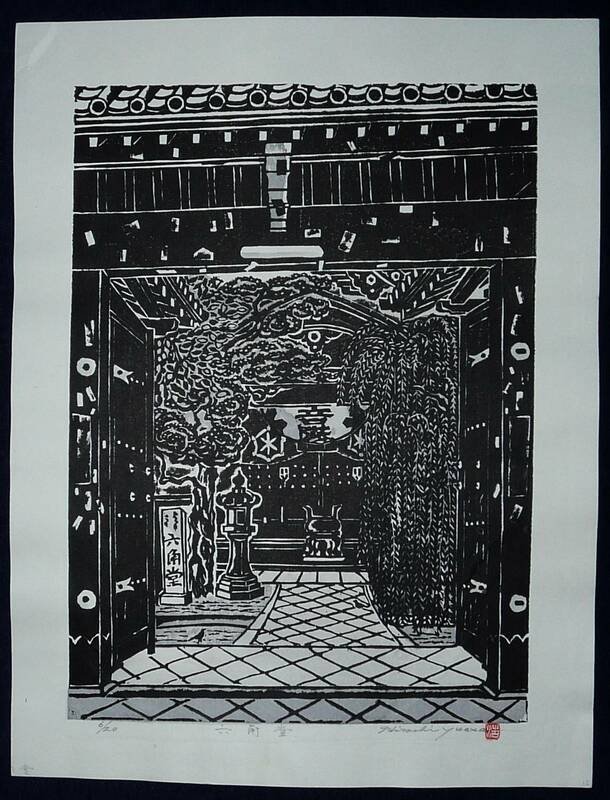 This makes the woodblocks look slightly wrinkled at the edges but this is not seem when they are framed. Woodblocks by this artist are very rarely found outside of Japan. 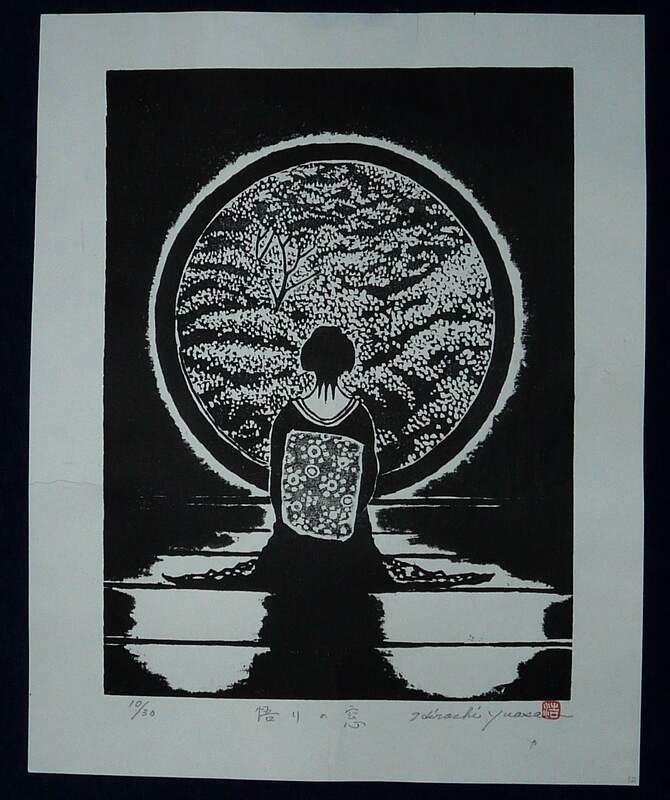 Hiroshi Yuasa’s few woodblocks which can be found unsold in Japan are all hand signed, titled and numbered limited editions of mostly small amounts rarely more than 20. HAND SIGNED, TITLED “Window of my Soul” AND NUMBERED all by THE ARTIST IN PENCIL IN THE BOTTOM MARGIN WITH HIS RED SEAL INCLUDED. NEW CONDITION Purchased direct from the Artist’s Archive. THIS LTD EDITION IS NOW SOLD OUT. WE HAVE NUMBER 12 of 30 IN OUR OWN COLLECTION BUT NO OTHER EXAMPLES OF THIS SCENE ARE AVAILABLE FOR SALE. 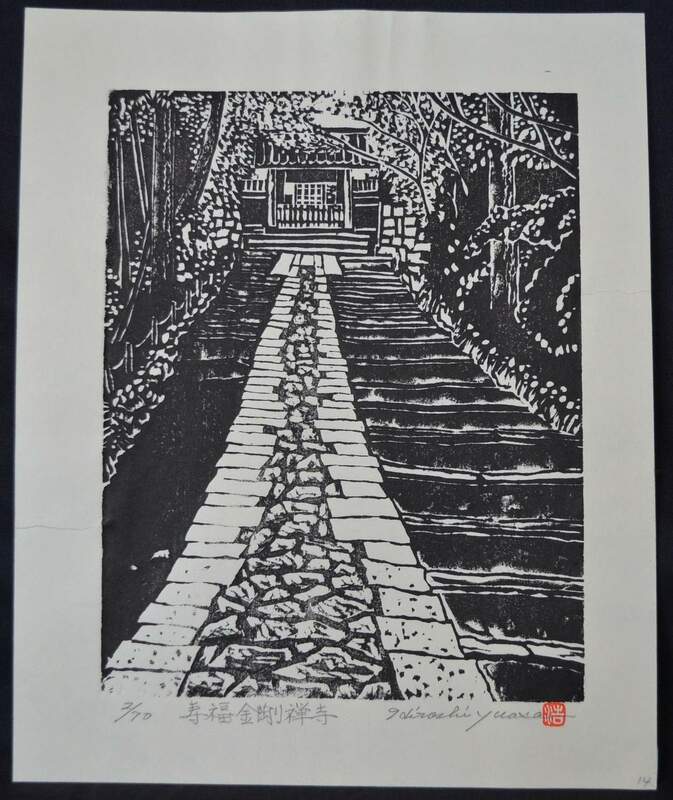 HAND SIGNED, TITLED, “Mikage-do Gate at Hongan-ji Temple” AND NUMBERED VERY Low Number 3 of Only 30 Ever Created all by THE ARTIST IN PENCIL IN THE BOTTOM MARGIN with his Red Seal Atop the signature. HAND SIGNED, TITLED, “Festival at Hongan-ji Temple” AND NUMBERED VERY Low Number 6 of ONLY 20 Ever Created all by THE ARTIST IN PENCIL IN THE BOTTOM MARGIN with his Red Seal Atop the signature. 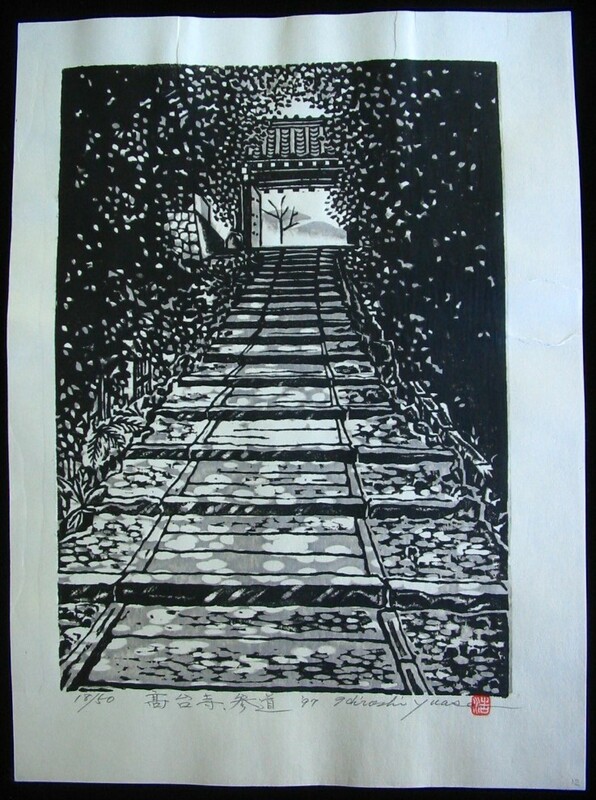 HAND SIGNED, DATED 1997, TITLED, “Stairs to Mikage-do Gate” AND NUMBERED Low Number 18 of Only 50 Ever Created all by THE ARTIST IN PENCIL IN THE BOTTOM MARGIN with his Red Seal Atop the signature. 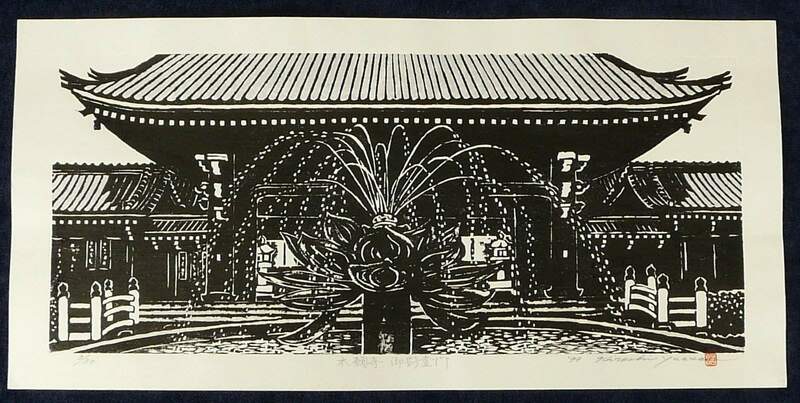 HAND SIGNED, TITLED, “Spring at Hongan-ji Temple” AND NUMBERED VERY Low Number 2 of Only 70 Ever Created all by THE ARTIST IN PENCIL IN THE BOTTOM MARGIN with his Red Seal Atop the signature.